Gobi looks like it might be for an H2 not an H3? or its a short version of the rack? If that bumper was just a little more cheaper, I really need to put a winch on the T.
I talked to the guy with this add. He's a couple miles north of me. The rack is for an H3T. There is some room to negotiate on prices especially if someone wants the whole package. If you are interested in any or all of this I am driving to Denver on the 21st next week and would be able to bring it all to you. That is if you are at Fort Carson. Could also bring it to Moab this spring also. If someone coming there wanted to buy it now and I can store it till then. We can put it on the trailer and bring it to ya there. Can help you install it too . Last edited by Reloader; 02-15-2019 at 12:06 AM. Huge thanks to Reloader on helping this deal happen!!! Thank you so much!!! Wow, you got that mounted fast! Cool deal. Just emailed the guy this afternoon about it but looks like you went ahead and got it. How was it getting it on? Got it on Thursday night and it was installed on Friday!!! I did the job by myself, just needed help to throw it on the truck. Two parts that were a pain, installing the winch on the bumper. The lower bolts to be to be exact, and the other pain was the lights. Had to make my harness which wasn't bad, what was kicking my behind was the room after the bumper was in place and trying not to get hit with hot solder. Thought I wasn't going to like having the remote box on top of the bumper, but I found a way to do it a little different from everyone else. 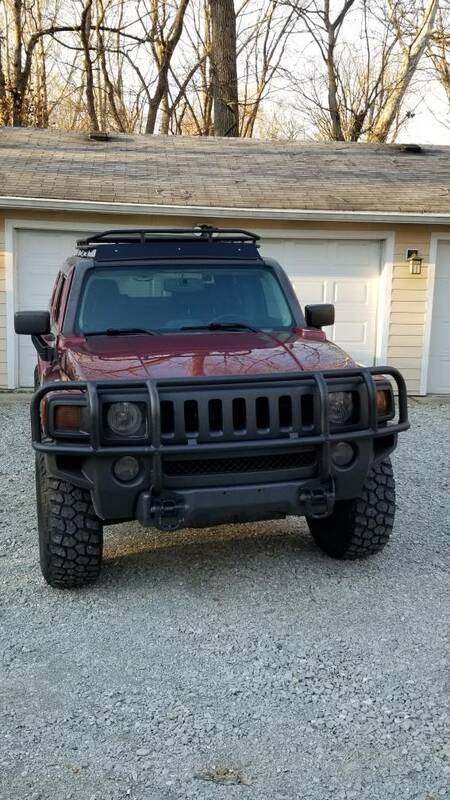 2009 H3 Luxury, ARB front bumper with 8K winch, 285-75-R16 Cooper STT, RockyRoad Sliders, OEM UCP, Gobi Ranger, and leveled with torsion bars cranked. Thanks for posting. My parents happened to be out in Florence visiting my brother. Made a deal with the seller, and it got free freight back to Indiana. BA Bumper with winch, rear bumper tire carrier, sliders, and roof rack. H3 What is the best type of bedliner to coat a Gobi rack and ARB bumper with?